Yesterday (July 11th) I was presenting at the very first SharePoint Saturday London. The SPS event was very well organized by Peter Baddeley and Seb Matthews. My session was about connecting IoT to Office 365 (via Azure). I used an Intel Galileo prototyping board with a Passive Infrared sensor (PIR). The sensor data was used to determine if a meeting room was empty or occupied. 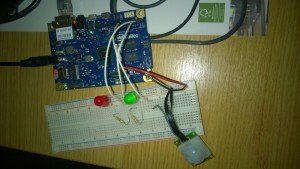 The raw data is uploaded by Galileo to an Azure Notification Hub. A continuously-running Stream Analytics job is then used to translate the raw data to 1-minute resolution of the room availability and to insert this data into Azure Table Storage. Finally, a provider-hosted Office 365 SharePoint application is used to visualize the room availability. The slides for my talk are available at SlideShare and the code is now live at GitHub.